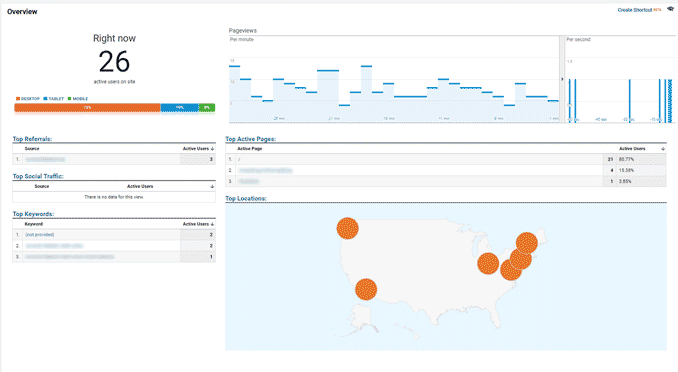 Google’s real-time analytics are probably some of the most useful yet overlooked features available to Google Analytics users. Not only can you monitor real-time activity as it actually occurs on your site or app, but you can also use the information to troubleshoot a wide range of problems, monitor website loads for developers, and gain valuable insights during short-term campaigns, current events, and PR related issues. The overview report is a great dashboard for seeing, as the name suggests, an overview of what’s happening on your site in real-time. It gives you a big-picture snapshot of what’s happening on your website at any given moment. The Overview report is something that I usually keep on in the background during campaign drops, major site changes or maintenance, or during times where we need to monitor PR related issues. Anytime a site launches, or we make major changes to something like an .htaccess file, DNS server, or server reboots this is a screen we keep open so we can monitor any major changes in traffic. Monitor regionalized website traffic as new pages are launched. Monitor PR issues if you have stores, branches or franchises in other cities. The moment something hits the media, you can pull up the location report to see how you are being affected in that area of the country. Monitor your geo-targeted campaigns as they launch and make changes in real-time. Real-time traffic reports are a great way to monitor campaigns when they launch and make sure traffic is flowing as you expected. The information is organized by Medium, Source and the number of visitors from each one. Monitoring site traffic during media related attention or during PR problems. When launching social campaigns or using shortened URLs, these reports can help you quickly identify any issues and correct them before they become a problem. To check UTM sources and mediums are formatted correctly before you go live with your email, search, or other campaigns that rely on UTM parameters. To make sure sources and mediums are being passed correctly when making changes in Google Tag Manager. Quickly make changes to your website when current events flood your site with new visitors or unexpected traffic patterns. For instance, maybe you are unexpectedly mentioned by a major media outlet which causes a rush of traffic to your site. This report can show you what people are looking for on your site and allow you to quickly make changes to those landing pages to influence these new visitors. Instantly identify campaign issues like bad links that may be pushing users to a 404 error page. Cash in on current events and trending topics by identifying blog posts or pages that are getting an influx of traffic and then linking to and highlighting those pages from your homepage. These reports are essential for learning how your users are interacting with your website or app. See if users are engaging with changes to your website as you expected. Test buttons, videos, and other events you are tracking in real-time as you make changes in Google Tag Manager. Make sure users are finding your call-to-action. See if visitors are converting right when your campaign launches. How much better would it be to make changes in real-time instead of analyzing report after your campaign has ended only to find out you could have made a couple of small changes and significantly improved your ROI? Test your conversion goal configurations before you launch. Make sure campaign launches are driving the results you’d hoped for in real-time. While historical analytics data is usually used to develop long-term campaign strategies, real-time analytics data can be used to make percission changes on the fly. 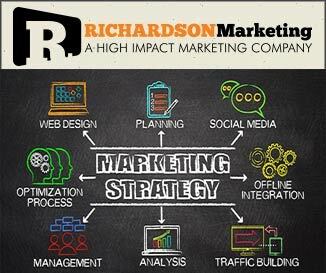 It might be just what you need to give your campaigns that added punch and increase your ROI. If your not using real-time reports as part of your analytics workflow, you need to take a serious look at incorporating them into your daily routine.